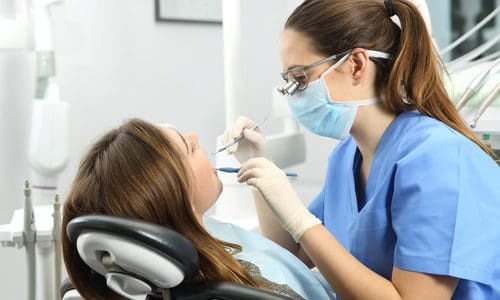 Every October the American Dental Hygienists’ Association (ADHA) and the Wrigley Oral Healthcare Program (WOHP) sponsor National Dental Hygiene Month to both recognize talented dental hygienists everywhere and to drive awareness to the importance of practicing proper oral hygiene. Of course this is a celebration our Evansville dental office can certainly get behind. In this blog, we break down each component of The Daily 4 and its benefits to oral health. According to the American Dental Association (ADA), you should brush your teeth twice a day for two minutes each using a soft-bristled toothbrush. Brushing is actually a delicate undertaking and you should use soft, gentle circles with your brush to effectively remove bacteria and plaque but not do harm to your teeth. When we brush our teeth and pass on the floss, we miss cleaning about 35% of each tooth’s surface. That leaves a lot of surface area free to bacteria that can cause decay. To make sure you’re getting the best clean possible, make sure to floss in between each and every tooth and up under the gum line every day. Using mouthwash can also be an important part of your oral hygiene routine. Therapeutic mouthwashes contain ingredients that help protect or fight off bad breath, gingivitis, decay, and plaque. But not all mouthwashes are created equal. Look for one that has the ADA Seal of Acceptance, this means the rinse you’re buying has scientific evidence that supports the claim made on the label. After meals, it would ideal if you could escape to the bathroom and brush your teeth. But we understand that’s not always an option. Instead, carry sugar-free gum on you at all times and pop a piece in your mouth after eating. Chewing sugar-free gum causes you to produce more saliva. This increased saliva helps neutralize food bacteria that tends to linger around in the mouth after eating. Again, look for a gum that has the ADA Seal of Acceptance. Following The Daily 4 every day can really help keep your mouth healthy. But that doesn’t mean you can skip your dental cleanings at our dental office in Evansville. Make sure you maintain bi-annual visits with your hygienist to protect your smile.